This piece is constructed with a massive walnut (Juglans spp.) twin plank top on walnut trestle ends and oak (Quercus spp.) sledge feet and measures 860 x 2,920 x 895mm. This trestle table, one of the earliest forms seen in European furniture construction, demonstrates both beauty and functionality. Its wonderfully abstract design allows the piece to be dismantled within the confines of a great hall or refectory. These were highly prized objects, from the residences of the very best families or important institutions. As such, they are sometimes referred to in medieval inventories or wills. Even as late as 1552, an inventory of Paget Place at Clement Danes records six trestle tables, a typical entry reading 'a table wt two trestolls' (S.W. Wolsey & R.W.P Luff, The Age of the Joiner, London, 1968, 95). This example with its bold architectural form relates to a table described as Pyrenees and 15th-16th century, see Collection Bruno Perrier, Haute Epoque, Adar Tajan, 6 April 1992, pp.24-26. The offered lot also recalls those sometimes referred to as 'bigourdane' because they were constructed around Bagneres de Bigorre. The oak feet were probably replaced because the original walnut rotted away due to contact with the damp floor and washing mops. It may look chunky and even 'crude' but it is worth remembering that this general form gave us one main stream of furniture - supporting furniture. Tables and benches were developed from this pattern and chairs developed from benches. I like this pattern so much that I have selected two big planks from a massive lime (Tilia vulgaris) tree that had to be felled at the bottom of my garden. I have these seasoning in my garage, together with some large solid baulks for the ends, and will make a similar refectory table for my dining room. The garage is a good place for them to season in an historically correct way because the humidity will be about the same as that in a Great Hall. I am sure that these tables were made green and slowly acclimatised in the shelter of a draughty hall. 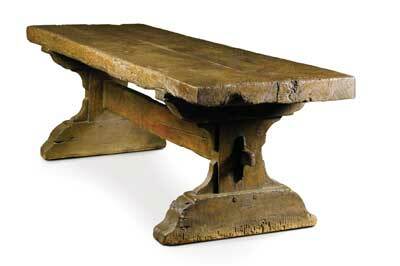 Trestle table in walnut and oak, Burgundian School, 15th century with later repairs.